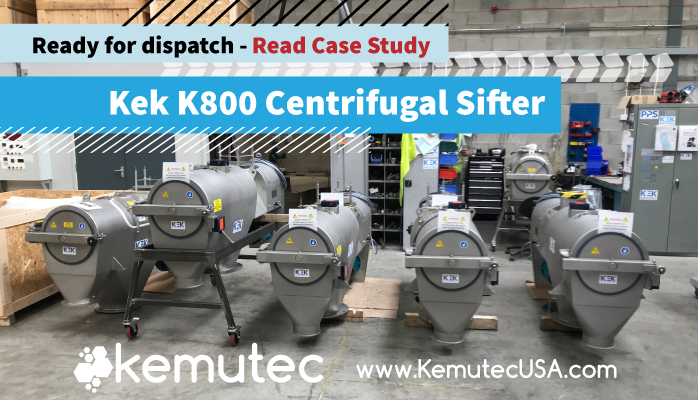 The Kek Centrifugal Sifter fitted with a standard Cantilever Shaft, delivers not only the best standards of hygiene and cleanliness but also unsurpassed reliability with minimal maintenance requirements. Handling/ Material: Granulated sugar, citric acid, starches, and sweeteners. Height adjustments to accommodate space constraints of manufacturing facilities. For improved hygiene and cleanability – the majority of flat surfaces were removed from the internal and external surfaces of sifters. High Efficiency 430 stainless steel perforated plate sieve assembly.